We really enjoyed this savory rice. It was quick and easy to make with excellent results. 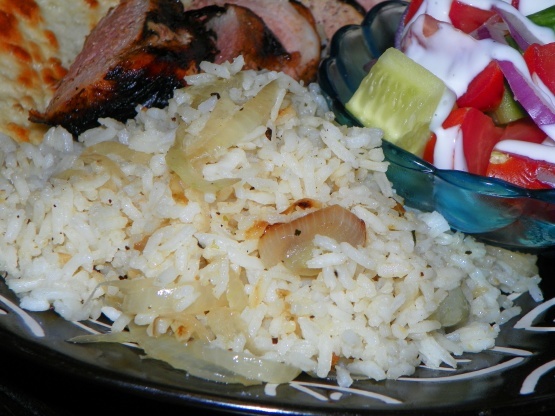 The rice was perfectly cooked, and beautifully flavored. Cook rice according to package instructions (for 3 cups of rice, put 2 cups of water in a saucepan with a tight-fitting lid, add kosher salt and bring to a boil. Add rice, stir; cover with lid, reduce heat to low and simmer for 20 minutes). In a skillet, saute sliced onion in 1 tablespoon of butter and olive oil for 5 minutes. Add sliced mushrooms. Saute mixture for 10 minutes or until mushrooms have softened. Season with salt and pepper to taste. To rice, add onion/mushroom mixture, poultry seasoning, chicken broth and 1 tablespoon butter. Combine and serve.